Fantasy RPGs - Final Fantasy or Shining Force? My exposure to early RPGs revolved around roughly three classes of RPGs--single character (protagonist moves one a map at the same rate as monsters that appear randomly--Rogue, Castle of the Winds), team line-dance (combat involves two lines of monsters and focuses more around timing and types of attacks and powers than movement or positioning--Final Fantasy, Chrono Trigger), and team free-move (each team member and monsters move around a map independently - Shining Force, Final Fantasy Tactics). Each type of game has its own unique awesomeness and enjoyment, playing up different types of play, paces and challenges. The famous cross fireball in Shining Force and games like it (line those enemies up!) racing the time-bars in the later FF games, crushing controller buttons to timed rhythms in Legend of the Dragoon, or cursing that skeleton you didn't see around the corner in Castle of the Winds. Even though Secrets of Steel is officially on hiatus, its underlying engine (The Storyteller) is now in use on the Android market in our newest game, Cyber Knights Elite RPG. Cyber Knights uses the team free-move combat type. In the coming weeks, Cyber Knights will support full team recruiting, and the full-blown team free-move combat system will be in action. But--what are you favorites and why? If we were making a darker, gritty RPG for mobile games (we are), which system would you want? I'd like to give you my elaborate answer, but since I do not quite grasp the concept of "game engine", could you answer 1 quick question: does that mean that SoS will essentially be CK with different graphics, sound and story, but will work like play like Cyber Knights? @risu - the game engine is the underlying technology that organizes and controls the major game blocks within the system. Saying that SoS and CK will both be built on the same game engine does not mean that they will basically be the same game with different graphics, sound, and story. Think of the game engine as the core,... let's say like a cassette player. The game itself is like the cassette which determines the type of music, volume, tempo and the like. That's probably a terrible analogy. Let's see... at a practical level the game engine understands Characters. You may have one or more of them, one of them might be designated the main character. The game (CK vs. SoS) determines what statistics and skills are available to characters. The game understands generic equipment, but the game determines the types, how they are used, what their stats and abilities are, etc. I am a die hard RPG games fan. I might even risk saying that I am an oldie. I am only 27 years old, so I missed a lot of awesome titles, pretty much all of it that was available on Spectrum, C64 / Atari and Amiga machines. When I started playing computer games and fell in love with RPG genre, PC was already dominant. I did however sorted myself with all kids of emulators, I loved playing older titles, I loved console games. I am a bit orthodox when it comes to Roleplaying games, as I am a P&P RPG fan (started with WFRP and went through most of major and a lot of fan made RPG games out there). Why orthodox? Because as long as I accept that now a days the genre is described mostly by the way you progress your character in terms of mechanics - gaining experience, levels, improving statistics, I do not consider simple games like Diablo (no offense, I am a die hard Diablo fan <3) pure RPG. On the other hand I personally consider Dune I (the game listed as adventure game) more of a RPG title than many "RPG games" out there. The story, the way your character changes over the course of the game, the sheer complicity of the world (based on one of the greatest Sci-fi books of all times after all) make it a great, roleplaying experience even without Strenght, Agility, Combat skills etc. All the games have cons and pros, all systems are unique in a way, so for the approach with SoS you should honestly just go with whatever feels more comfortable for you. To enjoy it. And I am sure your fans, me included, will love the game. Starting with the main point - and going a bit back to what I had said in my first comment - the system is not that important, as long as the game is playable (interface, simplicity) and the story is interesting and complex. I liked the Final Fantasy model, where you have your team / party opposing enemy forces. Facing each other, chasing / racing timer bars etc. I also like classic turn based combat, where you plan your movements, taking into account number of action points you have, line of sight, range etc. All the combat systems have advantages and disadvantages, that's obvious. I liked all of them (or the ones I encountered), but since CK introduced a turn based free combat system I would like to comment on that. Last iteration of CK I have seen, had a system where you - once in combat - move on the 2d map and once attacked by enemy you see some semi 3d duel like combat screen with you and the enemy firing at each other cowboy style. In my opinion it adds unneeded burden to the whole system. Now I know it might not be possible, because of the limitations of touch screen interface but I always felt that roguelike system (like in roguelike games or oldschool RPGs from Spiderweb Software - Exile series etc - http://www.spiderwebsoftware.com/) is more dynamic. The jumps between 2d non turn bases, 2d turn based in combat system (like in Exile 1-3) is something I liked a lot when I started CK, when I saw the additional screen (I mean this one: https://g1.gstatic.com/android/market/com.tresebrothers.games.cyberknights/ss-800-4-8) made me go "meh" a bit. I would like to underline, that I am trying to be civilized. I am not bashing you, because I am a simple end-user. I never made or attempted to make any game, and I love your games, but I am just saying how I feel, as you probably like to hear customers opinions as a developer. @risu - we love all feedback from you guys, especially when you are being civilized. The feedback is great, and the part about the UI being clunky something we have heard more and more as CK gets more exposure. At this point, its a good lesson for us in game design... do not build the UI organically, layout-by-layout or as an after-thought. I know this from my day job as a software development manager, the UX must come before you write the code! Somehow it didn't transfer completely to game design =) There are a couple of projects (one led by a forum user tsueg) investigating the upcoming overhaul. Happy to say, we are working on it! On the three combat systems, my main question was "which is your favorite." It sounds like you'd pick the Final Fantasy line-up system, which is a classic and fun. I loved FF3 and ChronoTrigger the best. As you mentioned, if the UI is good, then you can move at an amazing rate of speed in that type of interface and it can feel very very good. Every play Legend of the Dragoon - it was a PS game but one of the best in my humble opinion. Bah -- I'd say the real lesson is don't release two months early and expect people to see the end state as clearly as the designer. The ST RPG UI was way more clunky than CK was. In ST 1.0 you could only move 1 square at at time, could not scroll, there was no zoom map and no waypoints. The only way to travel was to memorize the map and use the coordinate display at the top of the screen. BETA games have to have a chance to evolve in the designer's hands or we end up with design by committee which never makes anything good. Have to say, ChronoTrigger and FF3 were great games and if I had never experienced anything better I'd be all over that. Also a big fan of FF Tactics and Vandal Hearts style rpg. I definitely think that the freedom of movement in CK is perfect for encounter battles. I honestly wish it could be used further for more types of encounter, "save the boss" or "find the briefcase before it's _(stolen/blown/etc)_"; something like that, but I understand there are restrictions too. Some of my favorite games however have been the final fantasy variety or the Wizardry first person looking down hallway mazes. Those games are a lot less immersive however than a game where you can see a guy and the world in more than the single "fight" background of FF or the innumerable like it. You definitely have the right idea with the direction you are heading now with CK, IMHO. Did you play Bard's Tale? I loved that game. @cory - oh the glory of Bard's Tale! Bard's Tale was an awesome incarnation of the first-person maze game. Absolutely top notch. Or play Betrayal of Krondor? The Shining Force series was by far the best series on the Sega Genesis. I remember this game for hours and turn it has never prevented me from playing again. I do not know if it was the unique history and its combat system. @wiolwaker - i can definitely attest to a very deep love of Shining Force. Simple game, but in depth and difficult battles. Simple story, but cool world and awesome art and animation. One of the very best! Do you guys know you have the most confusing forum registration? I tried the social account linking and used my Twitter account and I can't login. I then tried to register normally and I don't know if it's because I tried using mailinator to register but no matter the username, it keeps saying it's been registered. Anyway, as with most things, I think there comes a price of simply choosing the favorite. Most people would prefer high end graphics but then you start narrowing down the graphics and then some of their favorite games turns out to not be behemoths at all. Case in point, FF7 vs. FF6. One is often heralded as the best FF by fans but turns out to not even be a marketable recurring series while the other, even though many fans are ashamed of praising it's past it's prime graphics, appeals to people more than the more modern FFs but can also be turned into a successful movie, spin-off, etc. all based on the design of what it was. I bring this up because over here there are lots of cheap knockoff tablets running on Android and it's easy to miss out on many games simply because the games can't handle it and if Star Traders RPG was any more consuming, it would slow down and I never would have bothered with the game. On the flip side, the screenshots from Cyber Knight just doesn't convince me to check it out. No offense. Maybe the concept isn't just for me but the screenshot combined with STRpg's lack of story just doesn't compel me to try out the game at all. Mind you, even STRPG, chokes up on these cheap Tablets from time to time (options doesn't matter) but at least it runs decent on enough times and the Elite version is cheap enough all because these games aren't trying to be the Final Fantasy or Shining Force of it's niche. Towards my favorite, it's always a hybrid. Though not a direct example, engine wise, games like the Romancing Saga series and Live a Live (both on SNES) do the idea of a hybrid Shining Force/Final Fantasy proud in everything but hype and maybe epic feel. This is because they're less engines with tacked on features and more engines with different needs. Star Traders Rpg is both a good and bad example of this. -Surveillance and Blockade while simply being two separate buttons on the same screen have a different feel. -There's different ships that even if they are just carbon copies in look are all different and play (and get killed) by enough ships and you know what's what from what's not. -Explore is more like crew genocide. Can't make an exception. Yet the officers are rarely tampered with. -Finally there's the whole territories that can be seen on zoom maps. It makes it too unfair for everyone to simply try to take contracts. It's the Blockades and Surveillances that allow for Clan banging where two to three clans all hate on one clan and victimizing that clan is what gets the major rep bonus. In this same way, Shining Force went from mundane to great because it doesn't feel like you're removed from the battle and from peace time. Opposite of this, FF was all about battles even though it claims and is often praised for it's stories. It's simply a game whose engine says it's ok to dilly dally and grind when the sake of the world is at sake. The only thing that I know doesn't reward this is the "fixed" system implemented in Final Fantasy II. At the same time, I can't say I'm a big favorite of the opposite. I don't like how sometimes games need Ruby Weapon like solutions just to figure them out. It's great for special bosses but often times the puzzles often get too convoluted. This holds true for Final Fantasy as it holds true for most games. You're almost forced to use a walkthrough or a hints and tips just to not miss a missable on a first playthrough. 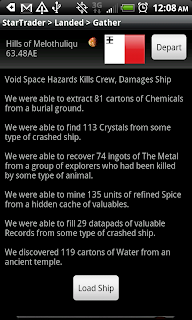 Star Traders RPG doesn't have one of those based on my lurking on the forum threads except maybe for switching from targetting the engines instead of the deck but it takes a while to realize on your own how the stats work, how the ships work, how to survive when there's no contract and you've just run out of money on water fuel in the hopes of getting to the next contract... in the old versions, due to lack of faction notifications during random encounters, it was even easy to piss everyone off and trigger all sorts of Solar Wars/Alliance accidentally. It really gets in the way of favorites as sometimes the best engines are those where the engine is just there to help you move through the world without expecting you to immediately assume a role where you suddenly possessed a guy who already knows the ins and outs of the world but you the player doesn't. It creates a world where the beginning is hard to figure out then the early game becomes easy once the optimum items are set up and then the middle to late game because more of a roll of dice/correct stat setup. Keep working on your strategy! Exploration and Caches are great strategies they just take some planning and more careful work than Contracts or Blockading. That's one of the great things about ST is that there are literally hundreds of viable strategies. I can tell you from experience they're all viable, but the tricks, techniques and modes of thinking that work for one will NOT work for the other. That's on purpose, took a lot of work and math to figure it all out.